Before Baltic Yachts delivers its 32.64m Inukshuk this week, her interior designer, UK-based Adam Lay, has taken us inside the custom sailing superyacht. The yacht was custom built for a keen yachtsman who currently owns a 24.9m yacht. 'I think it’s safe to say the yacht is an escape, somewhere to spend quality time with family and friends in an informal atmosphere, but the owner wants great sailing performance, hence he selected German Frers to design the boat,' says Adam Lay of Adam Lay Studio. German Frers designed the carbon-composite yacht, launched by Baltic Yachts in May 2013, to be a fast and efficient yet comfortable performer. Her telescopic lifting keel gives her a shallow draught. Inukshuk's sleek and aggressive exterior by German Frers is complemented by a welcoming, nature-inspired interior by Adam Lay to an owner's exacting brief. 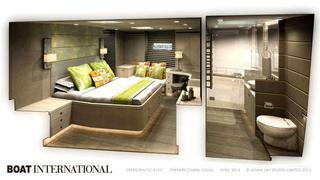 Next up from Adam Lay Studio is three motor yacht projects from 38m to 67m and a 'nice little sailing yacht project.' Stay tuned for more from this designer and sailing photos of Inukshuk after her delivery.